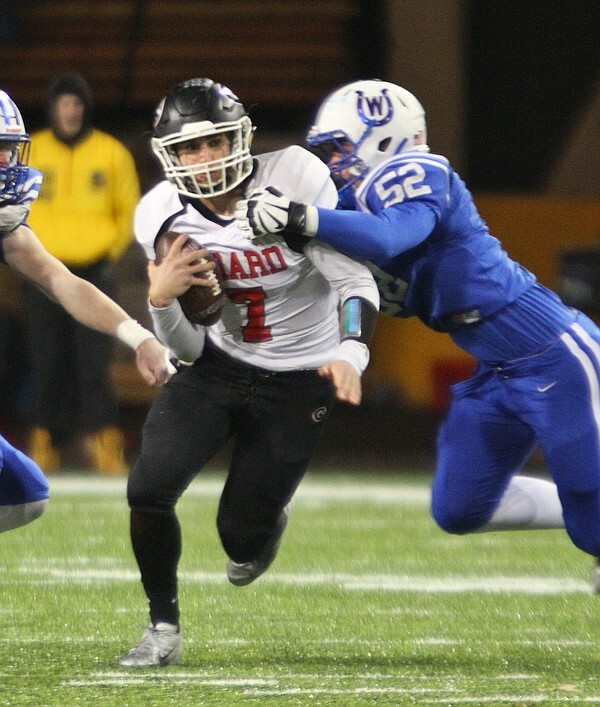 For four seasons, Girard High School football fans have watched Mark Waid blossom into one of Ohio’s all-time great quarterbacks. Saturday, in the biggest game in Girard history, Indians fans witnessed another star equally comfortable on a big stage. Cincinnati Wyoming’s Evan Prater rushed for 242 yards and passed for 149 as the Cowboys spoiled the Indians’ first state championship game with a 42-14 victory in the Division IV state final at Tom Benson Hall of Fame Stadium. “They were very talented, very aggressive, quick fast,” defensive back Aiden Warga said of the Cowboys (15-0). The score did not dampen Girard head coach Pat Pearson’s love for his team. “Just couldn’t be more proud of our guys,” Pearson said after the Indians’ first loss in 13 weeks. “This journey we’ve been on the last 15 weeks, this was never abut winning a championship or ring. Waid, who finishes his varsity career fourth Ohio history in passing yards, struggled. He passed for 194 yards and was intercepted twice. He led the Indians (13-2) in rushing with 31 yards on 13 carries. The Cowboys limited the Indians to 46 yards on 16 attempts. “He’s a great player,” Wyoming defensive back Joey Edmonds said. “When he has the numbers like [his], you’ve got to try not to focus on the numbers. Trailing 28-7 at halftime, the Indians surged in the third quarter. Pinned at the Girard 5, Waid threw a short toss to Nick Malito along the sideline and he escaped for a 95-yard touchdown. Then defensive back Jamil Bannister energized fans when he pounced on a Wyoming fumble at midfield on a botched reverse try. But the Indians were unable to capitalize on the break, following with three incomplete passes. One was a sideline throw to Malito that went off his fingertips. “That [could] have been another touchdown,” Pearson said. Wyoming ended up with a 29-11 first-down advantage, rushing for 355 yards. At first, Girard kept pace. After the Indians were stopped at midfield, the Cowboys needed five plays to take the lead on Prater’s 32-yard run. Waid directed an 83-yard march capped by his 5-yard run for a 7-7 tie. Prater’s arm then took charge as he connected with Edmonds on a 16-yard touchdown on a fourth-and-13 gamble, then a 29-yard scoring reception in the second quarter. Following a turnover, Prater’s 35-yard completion to Edmonds and a personal foul penalty gave the Cowboys first-and-goal at the Girard 7. Prater scored on the next play for a 21-point advantage.